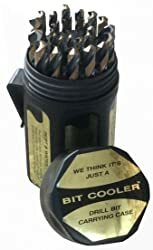 Best Cobalt Drill Bits Reviews: Buyer's Guide In 2019! Which Cobalt Drill Bits Sets Are The Best On The Market? Find the right set for the material that you are going to work on, find the right size, and weight of drill bits that will match your purpose. Some sets come in convenient cases that will allow you not to lose any tool and carry it anywhere. 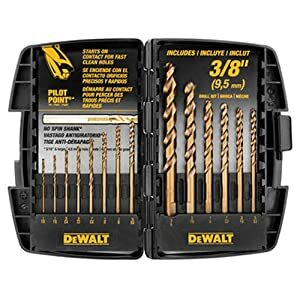 Find out more about popular cobalt drill bit sets and choose one to fix and create things in your house or to carry it to work. The product is made from Cobalt M42 Steel which has a melting point of 2,853 degrees Fahrenheit. The set includes 1/16″ to 1/2″ in 1/64th increments. 135-degree split point prevents “walking”. Drill bits are very sharp. You will be able to drill through the toughest steel like truck frames, stainless steel, farm implements, spring steel, and more. The product is made in the USA, guarantees the highest quality and provides a lifetime warranty. The product dimensions are 7 x 4.4 x 1.8 inches, weight 3.2 pounds. This is a super set that consists of 29 drill bit pieces. It is the best finding if you need to drill in tough metal, including heavy-duty abrasive alloy metal drilling on hardened steel. The product is made from industrial grade high-speed steel for increased durability. 8% Cobalt alloy is heat and abrasion-resistant. 135-degree split-point tip starts drilling immediately with less force and eliminates “walking” across the surface. Metal index case allows you easily identify and take the necessary drill bit. The set has got 1/16- to 1/2-inch in 1/64-inch increments. Due to a convenient and durable case, you can removable cartridges and carry bits from case to where the work takes place. The set’s dimensions are 12 x 7.5 x 4 inches, weight 4.4 pounds. The product’s weight 2.2 pounds. 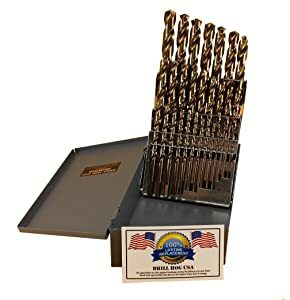 This is a super handy and portable set of 29 jobber length drill bits includes inch sizes 1/16″ to 1/2″ in 1/64″ increments. Cobalt steel provides a long-lasting tool life. 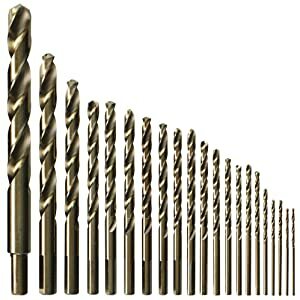 Each drill bit has got a gold oxide finish that helps to be wear resistant. Self-centering 135-degree split point penetrates hard material without a hole and gives small chips to reduce clogging. The set is stored in a very convenient small-size case that allows you easily access the necessary drill bits. Even when all hands are on deck, you can hang the case on your belt. You can also keep the case in your car as long as it does not take much room. 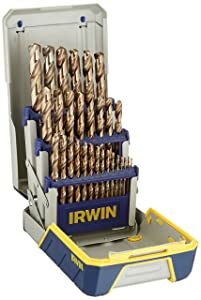 This is one of the affordable drill bit sets that can be purchased on the Internet now and simplify your work. Each drill bit provides maximum speed and long-lasting performance. The set of bits is made of industrial-strength cobalt guarantees optimum performance and durability in stainless steel and other metals. The set comes in a heavy-duty case that is made of industrial-grade ABS material and does not allow you to lose your tools. The set includes 14 bits ranging from 1/16-inch to 3/8-inch. With this very drill bits, your work will be done quicker and more effective guaranteed. The product dimensions are 8.8 x 8.8 x 1.4 inches, weight 12.8 ounces. The set is created for drilling in hard and abrasive materials. When using these drill bits, you are guaranteed to have clean and accurate starts. Three-flat shank provides a better grip on bits 3/16 inches. The bits were designed to perform excellently at very high drilling temperatures, and for superior performance in stainless steel in particular. Each bit has a clearly marked diameter, so you can easily identify while bit you need. He set comes without a case. The product dimensions 4.6 x 9 x 1.5 inches, weight 1.1 pounds. Now you know more about various sets, know how to compare sizes and choose the right tool for working on a certain material without damaging tools. Each set is affordable and meets the majority of purposes. Use one professionally or keep it at home for certain repairments.